I don't have much to show for the day. The alarm, of course, went off early, but it wasn't needed, since rally music has been playing full-blast since 6:45 am this morning. Apparently, today is election day. A) Take a bus to Hama in the beginning of the day, followed by an easy 48 k ride to the town of Homs. B) That will set me up for a 92 k ride the following day to Mar Musa, which the manager back at the hotel in Hama said was a monastery that welcomed overnight guests. If that fails, I can still arguably knock off the additional 60 k to Damascus. But I'd prefer the overnight in Mar Musa, since that sets me up for an early penetration of six million strong Damascus. C) This scenario creates a contiguous southerly ride. A nice safety is that, if getting the bike on the Hama-bound bus is a problem, I can accept Homs or even Damascus. 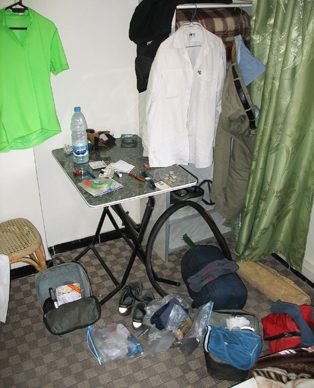 If I end up in Damascus, then I'll ride up to Baalbek and back to make up the mileage. As dusk approaches, I decide to bicycle back up to the Arab castle for another evening of an amazing view, tunes, and reading. Off in the distance, two boys are chasing a dog and pelting it with rocks. The dog is crying continuously. (Oh, the dark side.) I decide to get involved. I bike over and yell a very loud "Stop!" and then wave to the ground, which I believe means "Come over". The boys break-off the dog-chase and come over. They chat with me, not realizing that I don't understand one word. I sternly repeat "No," then as I prepare to bike away, I give them one of the chocolate bars I was planning to enjoy during my sunset meditation. Yep - this was the right thing to have done. Perhaps I've bought some dog karma. Up at the Arab Castle, once again I go about a hundred feet past the vendors, and am left alone. The light doesn't seem to be as special as yesterday. I'm also a bit curious about the view from the other, lesser hill, over by the tombs, a mile or so away. Ah, the advantage of the bike! I blast down the hill, past town, and around the main ruins. 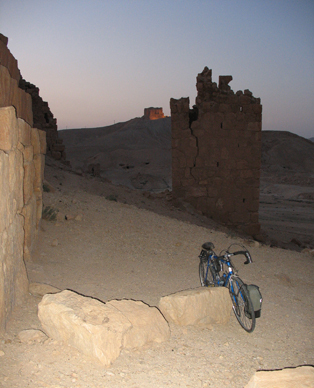 I cut back into the ruins opposite the Palmyra Cham Palace, biking up the dirt hill until my tires no longer grip, then stop to take pictures. As dusk becomes dark, I bike back to the hotel. I stop by the Traditional Palmyra Restaurant to ask where the bus stop is for getting to Homs. I'm given cryptic directions and told "Two minutes by bike." I go to bed with the alarm set at 6:10 am. Another reason rest-days are nice: you can spread your gear out.